How to Get Rid of Birds - Bird Pest Control, Bird Deterrents. Our BirdGuard team offer a wide range of Preventative and reactive measures to help solve your problem. Our BirdGaurd team offer a wide range of Preventative and reactive measures to helo solve your problem. 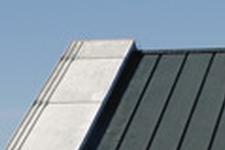 A leading Irish provider in the supply of all forms of bird prevention (pigeons, crows, seagulls, starlings etc). There is no bird problem too big or too small for BirdGuard! 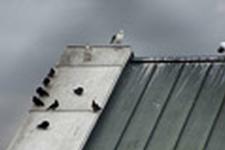 Pest bird infestations in commercial premises can create serious problems for property owners and catering businesses. As such proactive pest control treatments are required to take control of the problem before it has the opportunity to escalate. Such threats to commercial premises include; health hazards from the diseases pest birds carry, food contamination, damage to buildings and stock by fouling, increased property maintenance costs as well as loss of goodwill and increased risk of accidents. The type and extent of proofing you require is also determined by the level of infestation pressure. In turn, this depends on precisely how birds are using the locations – established nesting and roosting locations needing better protection than feeding sites. or any other bird species that’s become a pest. AVISHOCK helps deter birds by transmitting a noticeable but harmless electric shock to any bird which lands on the protected surface. This system is particularly ideal where the bird deterrent system needs to be unobtrusive so as to minimise any adverse visual impact on the building’s appearance. Tests have also shown that birds “learn” to keep away from the protected surface. Also because the system is flexible it can bend and adjust to usually difficult areas to protect like signage, statues, lights and so on. AVIPOINT is a range of bird spikes, which are very easy to store and install. The clever design and upward pointing spikes makes it very difficult for a bird to land but does not cause them any injury. 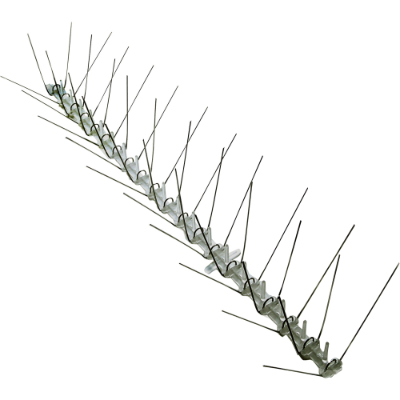 There is a range of 4 different types of spikes which makes AVIPOINT extremely versatile and suitable for excluding birds from daytime perching, night roosting and making nests. AVIPOINT is also very durable. With fully trained installers we assess the best locations for spiking and install. No fuss, no hassle! This is a very effective approach to bird exclusion which works by removing access to the birds’ natural perching and breeding areas. 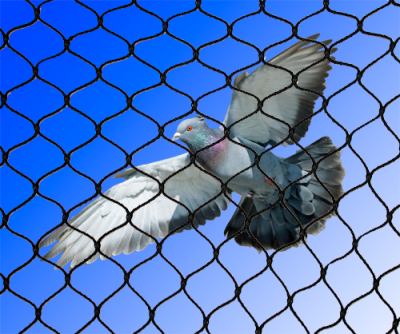 When properly installed bird netting should provide a 100% effective bird deterrent system. The netting is extremely strong and versatile and will deter birds from accessing areas you want to protect. At PestGuard we offer a wide range of removal options for your business. Please contact us for a plan designed to your needs. Every business’ worst fear is that a bird problem leads to the unsightly and potentially hazardous mess that they leave behind. 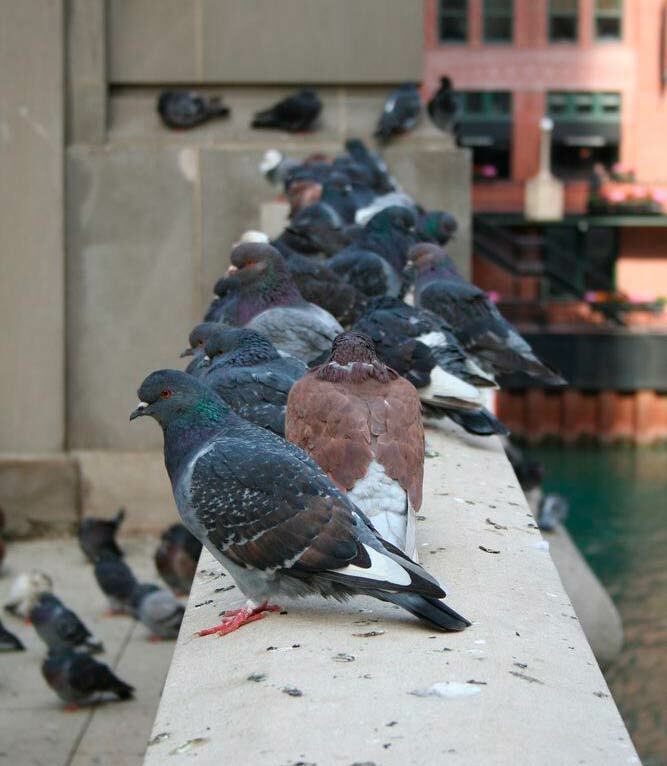 Pigeon droppings are not only unsightly; their acid content can eat into soft stone and cause long-term damage to buildings. The droppings, and feathers also block gutters and rainwater pipes causing potential overflows and water damage. Their droppings can lead to severe hazards on pavements, especially for the elderly, and can carry pathogenic organisms. Pigeons can carry a number of potentially infectious diseases such as salmonella, tuberculosis and ornithosis (a mild form of psittacosis – pneumonia-like symptoms). They are also a source of allergens, which can cause respiratory ailments like pigeon fancier’s lung and allergic skin reaction. 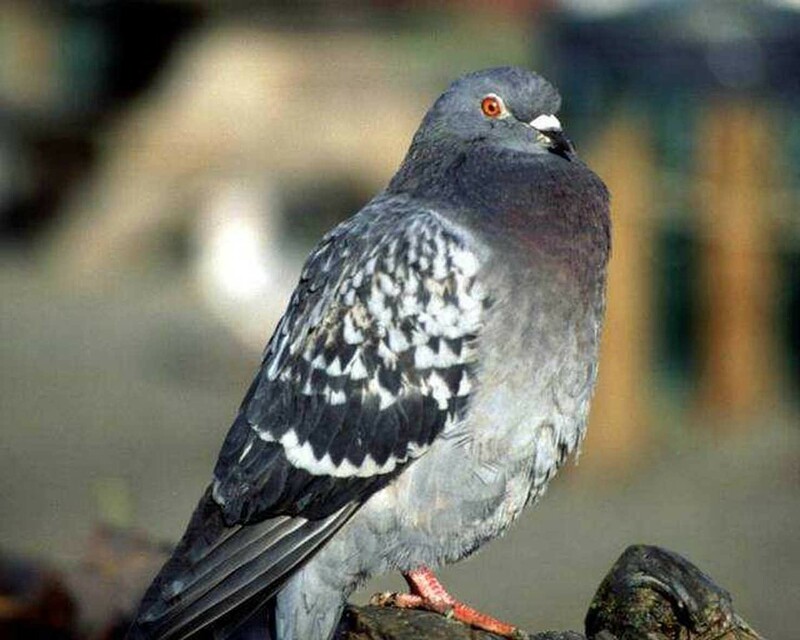 There is potential for these illnesses to be spread to people through contact with pigeon droppings, dandruff and feathers; pigeon parasites; or where dead infected pigeons get into food or water sources. It is vital with a pigeon infestation that a full treatment be carried out with the most effective biocide to kill the potential bacteria, followed closely by a full and thorough clean up of the affected area. PestGuard offer this service in full. From exclusion to cleaning we will look after your needs.